Part of the preventative maintenance that computers need is looking for problems. Hard drives store data in different sectors or segments on the drive itself. 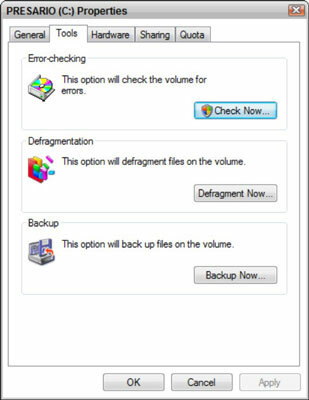 Windows Vista’s Error Checking program scans and evaluate each of these sectors to ensure that they’re all working properly. If there are unrecoverable sectors that can’t be fixed by using this utility, they will be flagged so that Windows doesn’t attempt to access them anymore. Right-click the drive you want to check and then choose Properties. In the resulting Properties dialog box, select the Tools tab and then click the Check Now button. If you have User Account Control activated on your system, you’ll see a message box asking you to confirm you choice. Just click Continue to proceed. In the resulting Check Disk dialog box, choose an option. Automatically Fix File System Errors: You have to close all files in order to run this option. Scan For and Attempt Recovery of Bad Sectors: If you select this option, it also automatically fixes any errors found, so you don’t need to select the first option as well. If the drive is not being used, such as a secondary data file, the scan will begin immediately. If you want to scan your system drive, you will receive a message telling you that Windows can’t check the disk because it’s being used. If this happens, you have two choices: cancel the scan or schedule it to run when the computer restarts the next time. 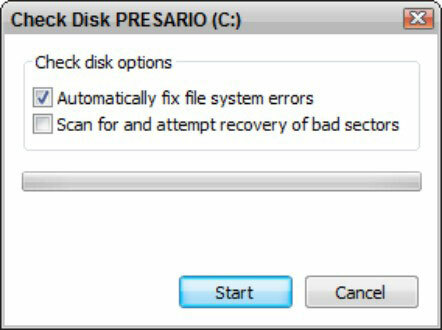 If you want the scan done right away, choose Schedule Disk Check and restart your system. Bear in mind that today’s 100+ GB hard drives take quite a while to scan. If you restart your computer into a disk check, you’ll have to sit on your hands and wait. Or better yet, start the scan and go get a cup of coffee.